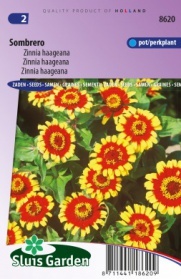 Sombrero has splendid yellow flowers with a striking blood red heart. This makes it excellent for attracting butterflies. It is mainly single-flowered. Best to sow directly in the garden. Sow in a heated greenhouse (22-25˚C). Prick out and later transplant or plant directly in a seedbed in the garden, allow to grow and then transplant to the final spot.